Have you ever come across a little fussy eater? It may be your own child or a friend or family member’s little one- but we all know the type! They are stubborn to the hilt and will often ‘not like’ food that they’ve never tried, simply because they don’t like the look of it! Luckily, here at Crafty Monkey, we have the perfect solution to those dinner time blues- why not make them a funny face plate to add a little excitement to their difficult meal times? The idea is that you paint facial features in whichever way you like, to make a face on the plate. The child can then embellish the features as they wish with their dinner. They can make hair from spaghetti, eyebrows from broccoli and even make the face spotty with peas! Endless fun at the dinner table! We can’t guarantee that the risk of food ending up on the floor, the walls and on top of your head will be totally eliminated- but it’s certainly worth a try! It goes without saying that we see a lot of little artists here in Crafty Monkey. As soon as a child is able to hold a paintbrush, they are able to make their own pottery creations and that’s what many of them do. Sometimes they are painting things for their own bedrooms, other times they are making gifts for grandparents or other relatives and it’s wonderful watching them put their heart and soul into their work (or sometimes slapping a few strokes of one colour on and then wondering off) and then admiring their work. They are always delighted when they collect their pieces a week later and they see the transformation as their item is all shiny and bright! With this in mind, we’d like to extend our favourite piece of advice to you as parents…please let them create with as little assistance as possible! There have been many occasions where we have watched as mum or dad will paint over their white bits or tidy up parts that they think look untidy. It’s so refreshing for us when the children are allowed to create whatever they wish and really put their own personal mark on it; especially when making gifts. Think about it for a moment- when granny receives her plate which will be proudly displayed in the kitchen- does she want to see a work of art that her thirty year old daughter has painstakingly tidied up and painted over to perfection or would she prefer to own the pink and purple musings of her three year old granddaughter which she’s filled with her own character? If you think that you will be tempted to interfere with your child’s creations- there’s a couple of ways you can deal with this. You can either paint a separate piece each (if you think they will get bored easily, get them a small pocket money piece to start with) or you can share one larger piece and let the child have their own designated section. We hope to see you soon with your little budding artist in tow! Today is ‘Bring Your Teddy Bear to Work and School Day’! We love this idea, after all- who doesn’t love to have their most reliable friend by their side during the day? 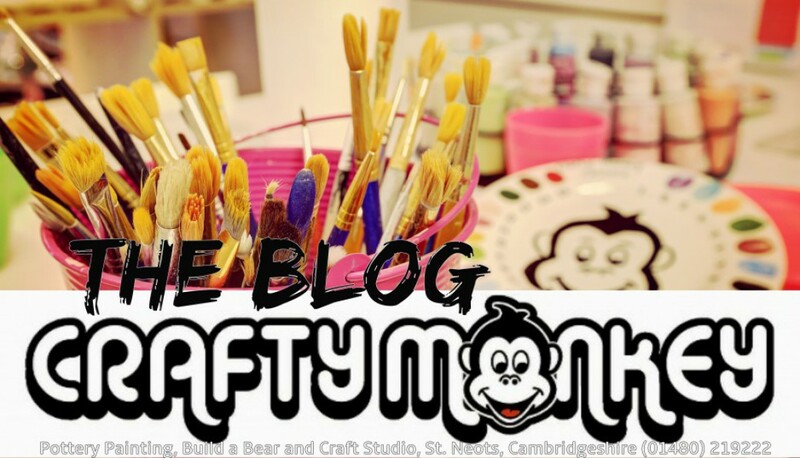 Many of you will have already adopted a bear from Crafty Monkey after making your own at a party or just for fun- but if not, pop over to put some love into creating your own little friend to take away with you. What many children love best about their Build a Bear friends is that they can dress them up in adorable little outfits from our massive range! Transform your hippo into a cheerleader or get your turtle into his cowboy gear and get out and about so they can strutt their stuff in their new togs! Why not drop by and see all our animals for yourself? They’re all desperate for new homes and somebody to cuddle up to…which one will be lucky enough to be adopted by you?